Last Thursday evening (26th April), saw the advent of the AGM of the Fordingbridge Twinning Association, with well over 100 attendees. This was not least, down to the fact that the results of the annual schools’ competition results were announced. 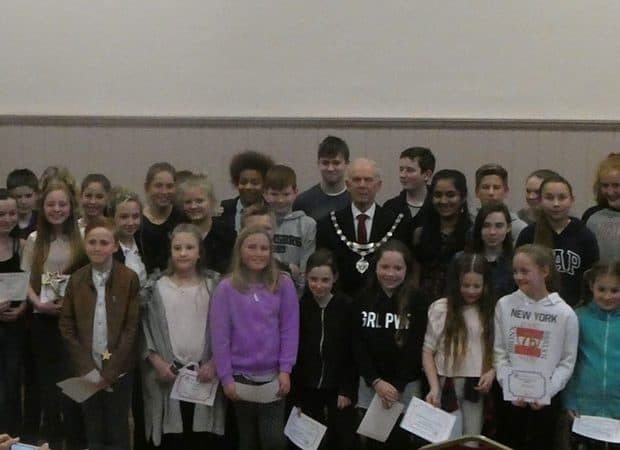 The picture illustrates Malcolm Connolly, Mayor of Fordingbridge, with all the winners, after presenting prizes to them. This year, the theme was “100th Anniversaries”, and not surprisingly, there were numerous entries related to the end of WW1. After the presentations of the prizes, refreshments were provided, before reconvening for the general business of the AGM. Last years’ very successful 35th anniversary of the Fordingbridge Twinning Association, with nearly 100 visitors from France, was discussed in depth, as well as other amusing incidents and events. The treasurer announced that the annual subscripting would continue to be on a “per-household basis”, and this would be £10 per annum, per household. a) The annual Boules event during the evening of Thursday 21st June (so put it in your diaries) This will be held at Sandy Balls, at Godshill: hence the name “Sandy Boules Tournament”! c) The very successful, always a sell-out evening, on the immediately succeeding Saturday evening 27th October, “Musical Soiree”, again with music from “Blue Tides”, the very popular band from last year’s event. The food and drinks will have been purchased in Vimoutiers, during the immediately preceding weekend: Genuine French fayre then! d) The regular Murder Mystery evening will take place during the following February (2019) on Saturday 9th February: something else to look forward to!